When you have sensitive skin, lathering up can often turn into an itchy, irritating experience instead of a cleansing one. Chock full of phthalates, petrochemicals, parabens, sulfates, triclosan and aluminum, it’s no wonder that most soaps leave sensitive skin beauties feeling less than fresh. 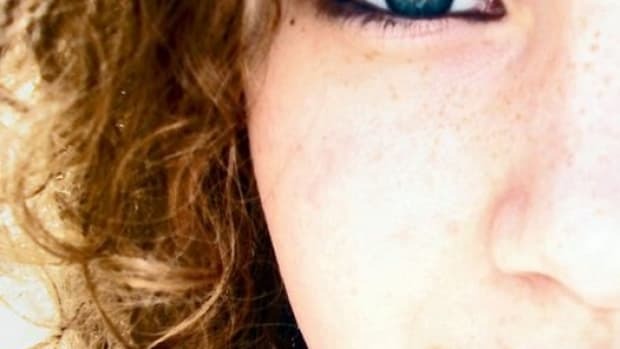 Artificial fragrances and synthetic dyes don’t help. Even the natural essential oils used to perfume organic products can inflame sensitive skin, leaving rashes and blemishes. 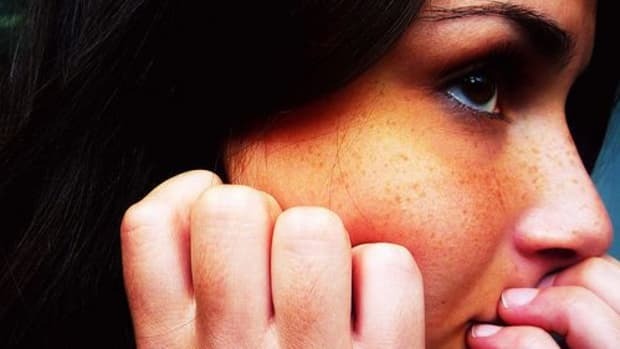 Soaping up shouldn’t leave your skin red and raw. These five organic body washes keep it simple. No fragrance. No unnecessary additives. Just pure ingredients that naturally cleanse, moisturize and nourish skin. Meant for all skin types, but especially for those with skin sensitivities, this body wash gently cleanses skin. A mixture of milk thistle (an antioxidant), vanilla extract and sunflower oil moisturizes and heals dried, tired skin. White tea naturally fights oil-causing bacteria. Keep in mind that this body wash isn’t USDA-certified organic, although it does contain nine certified organic ingredients in a total of 23 ingredients. See a full ingredient list here. 8 oz for $16.50. This simple body wash contains a host of hydrating ingredients that feed the skin. 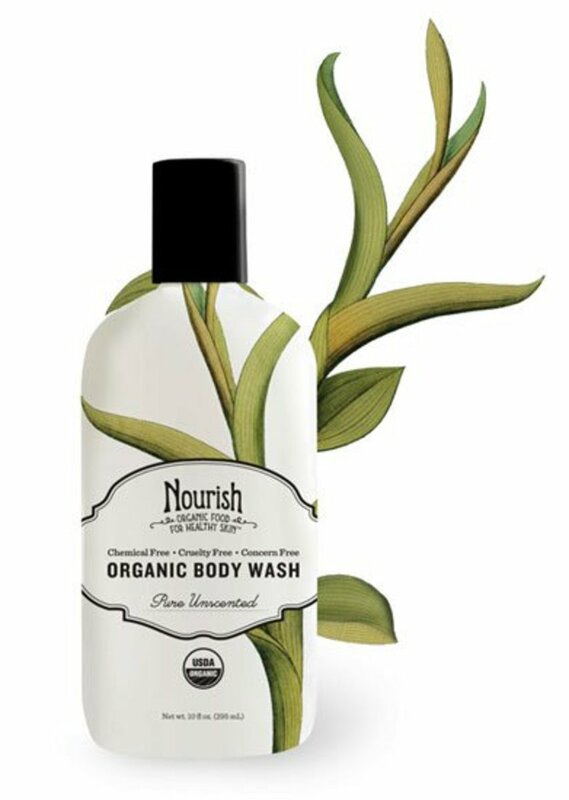 Nourish Organic Pure Unscented Body Wash contains only USDA-certified organic fruits, vegetables and plant extracts meant to nourish skin. Soothing aloe juice, coconut milk and Vitamin E mix with a special blend of coconut, sesame and sunflower seed oils. Guar bean naturally gives this wash texture and a light, rich lather that leaves skin feeling soft and refreshed. This milky-colored body wash contains just 12 ingredients. See a full ingredient list here. This wash is also certified organic by Oregon Tilth, and is gluten-free and vegan. 10 oz for $ 9.99. This gel-like soap lathers well and gently cleanses skin with natural sugars and coconut. Desert Essence Organics Fragrance Free Body Wash also contains organic aloe vera and organic green tea, which are rich in antioxidants, to sooth and calm skin. It leaves skin feeling nurtured and offers just a hint of a fresh, tangy scent. 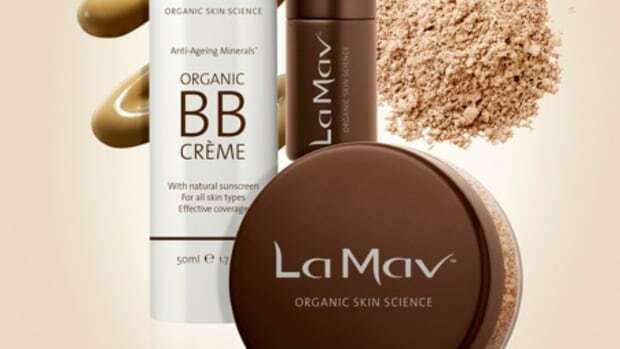 Of its 16 ingredients eight are certified organic to the NSF Organic Standard. See a full ingredient list here. 8 oz for $8.99. Perfect for those with sensitive skin, this silky organic body wash pampers skin with its mix of just seven pure ingredients. 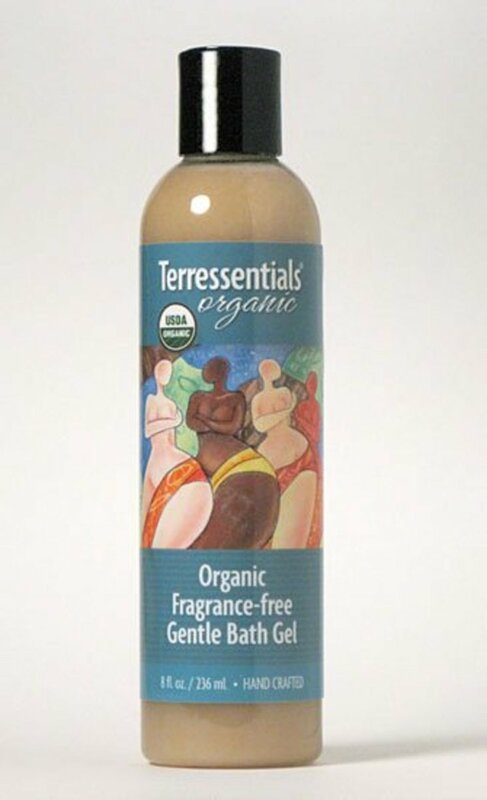 Terressentials Organic Fragrance-Free Gentle Bath Gel doesn’t produce a lot of foam, but it doesn’t need it. This simple gel cleanses skin without stripping it of its natural oils, leaving you feeling smooth all over. All of the ingredients are USDA-certified organic, meaning the company only uses ingredients certified to go into organic food. Its ingredients do look good enough to eat: organic aloe vera juice, organic olive oil castile soap, cold-pressed organic jojoba oil, extracts of organic curcuma longa, organic calendula, organic althea (marshmallow) and orgaic alchemilla (lady’s mantle). Even though this body wash doesn’t contain fragrance, it still offers up a nice, clean scent. 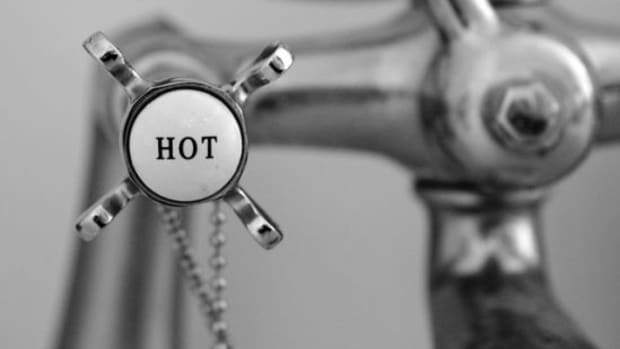 This simple bath gel also works great for shaving. 8 oz for $10.75. This simple conditioning soap from industry staple Dr. Bronner’s offers an earthy scent and feel as you lather up. Dr. Bronner’s Organic Hand & Body Shikakai Soap Baby Unscented is a brown liquid that’s not as eye-catching as some soaps, but its ingredients make up for the plain color. And, at least it doesn&apos;t contain any synthetic dyes. The organic shikakai, where the soap gets its name, comes from seed pods of the South Asian tree Acadia Concinna, which has been used for millennia in India as a gentle cleanser for skin and hair. Dr. Bronner’s extracts the shikakai from the seed pods and combines it with organic sugar and grape juice, as well as its signature castile soap base, to make a soap that leaves skin feeling clean, refreshed and moisturized. This soap contains just 10 ingredients, all of which are USDA-certified organic. They include: organic white grape juice, organic sucrose, organic coconut oil, potassium hydroxide, organic olive oil, organic shikakai powder, organic hemp oil, organic jojoba oil, citric acid and tocopherol. So simple! Packaged in a handy pump bottle, you can use this soap as a hand soap by the kitchen sink or as a body wash in the shower. Your choice! 24 oz for $16.99.